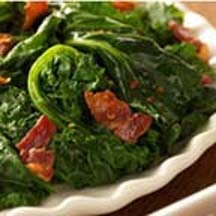 Simply said, a side dish of tender-cooked greens, seasoned with bacon, garlic, red pepper flakes, sugar and cider vinegar, is Southern comfort food at its best. In a large pot over medium-high heat, add bacon. Stir and cook until bacon is crisp and remove. Return pot and bacon fat to heat and adjust heat to low. Add garlic and cook for 3 minutes. Then add red pepper flakes and cook one more minute. Add remaining ingredients and bring to a low simmer. Loosely cover and cook until greens are tender. Adjust seasoning with salt and pepper, and garnish with crisp bacon.